OTTAWA — A bill designed to curtail food and beverage marketing aimed at kids is expected to clear legislative hurdles in the new year as the Liberal government tries to combat rising obesity rates. Bill S-228 was brought forward by former Olympian and now senator Nancy Greene Raine, who says the restrictions will help, though there is no “magic bullet” to address the problem. “The low-hanging fruit is to prevent the marketing towards kids,” Greene Raine said. Greene Raine’s bill has reached second reading in the House of Commons, where it is being shepherded by Liberal MP Doug Eyolfson. It wouldn’t come into force until two years after it receives royal assent. Eyolfson, a medical doctor from Winnipeg, said he is “quite confident” the legislation will pass in 2018, noting it will help ensure foods high in fat, salt and sugar can’t be marketed to children — a vulnerable demographic. “We know that advertising works in all age groups and that when you establish behaviour patterns in children, you basically have behaviour patterns and preferences that will persist throughout life,” Eyolfson said. The legislation will not change what products anyone can sell nor is it telling parents what they should or should not feed their kids, he added. The food industry has raised several objections, including that would it ban marketing to people under the age of 17. That age limit means an individual can join the military but potentially not watch a food or non-alcoholic beverage ad on Hockey Night in Canada, Canadian Beverage Association President Jim Goetz told a Senate committee in June. “That is why we cannot support federal legislation that eliminates advertising of products and sponsorship of events directed at adults or are ones that children attend with adults,” he said. Olympian turned senator Nancy Greene Raine brought forward a bill that will hopefully see the end of junk food marketing towards children. Health Minister Ginette Petitpas Taylor said the age limit will be amended to 13, based on legal precedent in Quebec. “To be very frank, this was a decision that I made personally because I just really want to make sure that we are not going to be finding ourselves in court and then everything is going to be on pause,” Petitpas Taylor said earlier this month in Fredericton. The government will also ensure sports sponsorships, such as Timbits hockey, are exempted. “What separates our firm from several others in the UK is the fact that we practice both Canadian and UK immigration law. We are also the only ICCRC regulated company with offices based in both countries. Please note that Sterling Immigration are also regulated by the OISC to provide UK immigration advice (Reference Number F20170008). Please visit our dedicated UK immigration website for further information. It was over 30 years ago that a young Romeo Saganash first attended negotiations at the United Nations in New York City to help push Indigenous rights to the level of international law. Saganash now stands ready to see his private member’s bill adopted by Parliament, thereby incorporating the United Nations Declaration on the Rights of Indigenous Peoples (UNDRIP) into Canadian law. Bill C-262, he says, is his attempt at reconciliation. Saganash was born in Waswanipi, and first went to the UN in 1984. A year later he founded the Cree Nation Youth Council, and in 1989 became the first Cree person in Quebec to achieve a law degree. In 2011, he was elected a New Democratic Party Member of Parliament for Abitibi–Baie-James–Nunavik–Eeyou for the first time. He introduced Bill C-262 in April 2016. At the time, Justin Trudeau’s Liberal government opposed the bill. Famously, Justice Minister Jody Wilson-Raybould, who is herself Indigenous from British Colombia, called UNDRIP “unworkable” within the context of Canadian law. That all changed in November at an event to celebrate the 10th anniversary of the UN’s adoption of the Declaration on December 13, 2007. At the time, only four countries in the world opposed the Declaration, including Canada. In a speech to a Parliament Hill rally December 4, Saganash said that the government only supported it because of widespread pressure from people across the country. A few hours later, he was inside the House of Commons for the first debate on the bill since it was introduced last April. Saganash reminded MPs that the bill is not about creating new laws or rights; it’s simply about recognizing rights that are fundamental, inherent and pre-existent for Indigenous Peoples. “Bill C-262 is about human rights. Bill C-262 is about justice. Bill C-262 is about reconciliation. If we are true to our commitment to reconciliation, this is the first step in that direction,” he declared. Speaking on behalf of the government, MP Yvonne Jones, Parliamentary Secretary to the Minister of Indigenous and Northern Affairs, said the government was proud to support the bill. “We will do what is long past due in this country, which is to bring forward the right legislation and standards to ensure that self-determination and the inherent rights of Indigenous People are respected in the lands that we all love,” said Jones. Saganash said he expects Parliament to vote on the bill sometime in late February or March. Canadian commercial-property investment is on track to break last year’s record, according to CBRE Group Inc., driven by demand for a haven from global instability and a quest for yield. CBRE forecasts transactions topping $40 billion for 2017, up at least 15 per cent from last year’s record of $34.7 billion, the real estate services firm said in a statement. Transactions for the fourth quarter haven’t been accounted for yet, but investments for this year through September totalled $33.1 billion, almost matching all of 2016. Real estate no longer looks like an alternative asset class, Peter Senst, president of Canadian capital markets for CBRE, said. Demand for commercial assets in Canada’s most populous cities, including Toronto and Vancouver, is sending prices soaring. The vacancy rates in these cities are among the lowest downtown office vacancy rates across North America. Among the most active investors in Canadian commercial property are pension funds, so far accounting for 26 per cent of all transactions above $10 million, an 82 per cent increase from the same period in 2016, according to CBRE. Foreign demand continues to soar for Canadian commercial investments, accounting for 15 per cent of all transactions above $10 million. One of the attractions for foreign investors is a soft Canadian dollar. 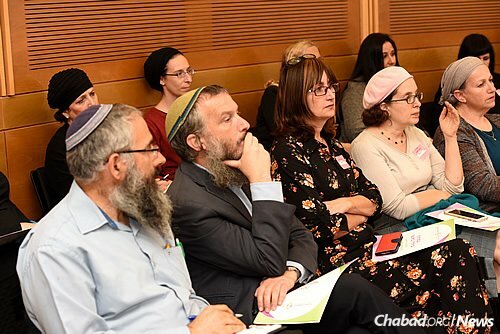 Chabad-Lubavitch emissary Goldie Plotkin was invited to speak at a Knesset meeting last month on the need for premarital counseling for Jewish men and women. Plotkin, who along with her husband, Rabbi Avrohom Plotkin, co-directs Chabad Lubavitch of Markham in Toronto, Canada, has been counseling young couples for more than 18 years and has recorded videos of her workshops for Chabad.org. 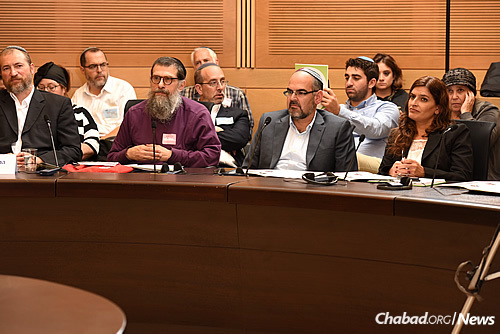 This mother and grandmother described her most recent trip to Israel, the rather impromptu visit to the Knesset and the importance of communication for couples once wed.
Q: So how did the presentation in the Knesset come about? A: I was in Israel for a community mission; we took several community members on a tour to Poland and then Israel. Two weeks before we were set to leave, I got a call from Susan Barth, the founder and director of B’Yachad B’Osher, the “Together in Happiness Center for Marriage Education.” She told me that she watches my workshops online and has begun offering premarital classes in Israel. 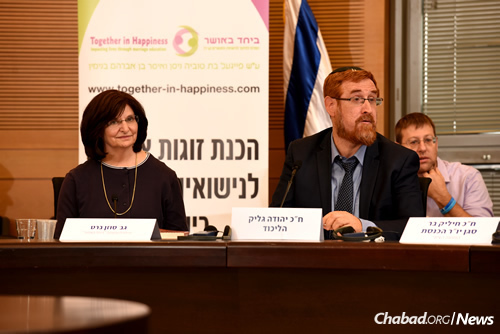 She also mentioned that Knesset Member Yehuda Glick is proposing legislation to make premarital counseling mandatory in Israel, and that a committee meeting was scheduled for November 8. Q: Can you describe your address? What were some of the highlights? 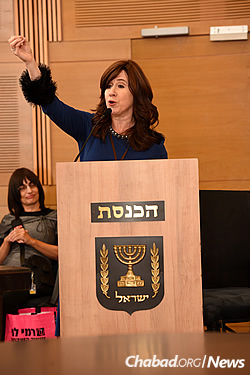 A: I spoke in English, even though it was the Knesset [where most matters are undertaken in Hebrew]. I was the only religious representative who spoke; I gave the Torah perspective on marriage. 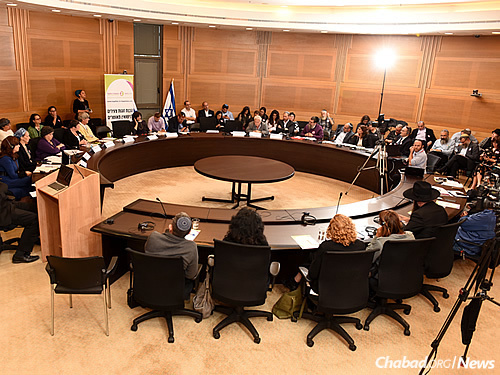 Other speakers included therapists, judges, doctors and a mediator, all of whom discussed marital problems in Israel, how they are climbing, and the affect this is having on families’ mental health and the economy. They were trying to impress on Yehuda Glick that this is legislation that must be passed. Q: I understand that you got some very exciting news just before you started your talk. A: Yes, I got text that my daughter back home in Canada was in labor. I said I’d like to ask all people of this holy place [Jerusalem] to say a blessing that my daughter should have an easy birth and the baby should be healthy, and everyone said “Amen.” My brother, Rabbi Kasriel Shemtov, executive director of the Mayanot Institute of Jewish Studies in Jerusalem, joked that this was the first time that something was raised in Knesset and agreed upon that same day. Q: How long have you been offering marital classes? A: Marriage is my passion. I have taught brides about the importance and beauty of mikvah since I arrived in Canada 32 years ago. My husband and I turned it into a couple’s workshop 18 years ago, when we created a more expansive curriculum. Today, we run a six-week course that covers the mitzvah of mikvah and marital communication. Why do we get married? To buy a house? To have kids? We get married because in Judaism, marriage is kadosh [“holy”]. And when a man and a woman stand under a chuppah, they bring G‑d as a third partner. When a husband and wife begin their journey with G‑d’s blessing, they’re already headed for success. Q: In your opinion, why is there such a need for these classes? A: Sadly, I don’t know how many kids today are seeing great marital role-modeling among their parents and other adults, so it’s very important to give them the skills to succeed in marriage. A lot of people know what not to do in a marriage, but that’s just the first step. We try and start at the basics through role-playing games, introducing different scenarios and more. We give each couple an envelope and ask them to write a letter to themselves about how they envision their marriage to be. We send it to them about four months into their marriage. The letter can serve as a reminder of the importance about treating your spouse with derech eretz—with respect and the love you share. The Rebbe [Rabbi Menachem M. Schneerson, of righteous memory] speaks so much about marriage, and that the foundation of the Jewish people is a stable home. The whole world is looking at what’s happening in Israel. . . . What’s the talk in the Knesset? We’re listening, we’re learning, we want to know. Because you are the light unto the nations. And the way you go is the way we go. So this is the most crucial legislation you can pass. If our marriages fall apart, there goes the Jewish family. Who are we, if not for our homes? Q: What is the secret of a good marriage? Men and women come from different planets; they speak different languages. Communication is key, which is why we focus on communication skills in our classes. What makes people G‑dly is our ability to communicate our thoughts and our emotions. That said, you shouldn’t give your spouse the silent treatment; women tend to do this when they’re upset. But men can’t read minds . . . and who would want them to anyway? When you learn how men and women think differently—and that there are different ways to speak and discuss important matters—we learn to adapt and make tiny changes that can have the greatest impact on a marriage. Couples have to appreciate how deep and important this relationship is. A Canadian judge granted a temporary stay, Friday, to a law that banned face coverings on those who provided or received public services in the province of Quebec. Justice Babak Barin ruled that the province cannot order people to remove their face coverings until a provision is put into the law that allows for citizens to apply for religious accommodations. The law, called Bill 62, was seen by many as targeting Muslims because some Muslim women wear niqabs or hijabs. The province said the law was only to provide clear separation between state and religion, known as a state religious neutrality law. The National Council of Canadian Muslims (NCCM) and the Canadian Civil Liberties Association launched a court challenge to the law, arguing that it violates the freedom of religion and equality. They asked that the law be set aside until the court could rule whether it is unconstitutional. But the justice did not go that far and granted a temporary stay, until the provincial government provides a section to allow those who object to the law on religious grounds to file for exemption. Bill 62 does have a clause giving people the right to file for religious accommodations, but that part of the legislation has yet to be put into force. As such, the justice ruled the law is incomplete. The government said the religious accommodation clause would not be ready to be put into effect until summer. “I understand the position of the court,” MacKenzie told Canadian media. Quebec Premier Philippe Couillard said the government was not surprised by the ruling. “I’m not unsatisfied with the judgment because there’s no mention of a violation of the charters (of rights) or any major constitutional problem,” he told reporters. CHICAGO, Nov. 14, 2017 (GLOBE NEWSWIRE) — iManage, the company dedicated to transforming how professionals work, today announced that Stikeman Elliott LLP — one of Canada’s leading business law firms — has selected iManage as its firm-wide Work Product Management platform. /EIN News/ — After conducting a comprehensive internal review of its business processes and work product management needs, the firm sought a world-class, fully integrated solution. The solution had to address firm members changing needs and expectations around how technology can better support document and email management. iManage delivered a platform that fully meets the ever-increasing needs for governance and protection of sensitive data. A Canadian Muslim group and a civil liberties association on Tuesday filed a challenge to a law in Quebec province that forbids face-covering by those who wish to access or provide public services. The law represents “blatant and unjustified violations of freedom of religion”, the National Council of Canadian Muslims (NCCM) and the Canadian Civil Liberties Association said in the filing in Quebec Superior Court. They argue the new face-covering law takes direct aim at Muslims who wear a niqab or burka and runs contrary to the Quebec Charter of Human Rights and Freedoms and the Canadian Charter of Rights and Freedoms. Both charters ban discrimination based on personal characteristics, including religion or creed. At a news conference Tuesday in Montreal, Ihsaan Gardee, executive director of the NCCM, said the law is discriminatory. “Our legal challenge targets the heart of what this law really is: a discriminatory, unconstitutional and unnecessary piece of legislation that excludes and stigmatizes an already marginalized and vulnerable minority of women and, by extension, the larger Quebec Muslim community,” he said. Under the law, public servants such as teachers and nurses are forbidden to wear any face covering while providing services. Anyone who wishes to access public service, such as a student boarding a bus who wants a student fare, must uncover her face for identification purposes. The Quebec government passed the law last month, reasoning it was to separate the state and religion, as well as allowing proper communication, identification and security in public services. Justice Minister Jody Wilson-Raybould told Anadolu Agency her department is aware of the legal challenge and that the government does not want to dictate how Canadians should dress. “We have been following the progress of Bill 62 and appreciate the importance of the issues it raises,” she said. “As the Prime Minister [Justin Trudeau] has said, we do not believe that the government should be telling people what they can and cannot wear. The law was widely criticized, including by the Quebec association of municipalities, Montreal mayor-elect Valerie Plante and the premiers of Ontario and Alberta. Two Quebec Muslim women were also included in the court filing. Fatima Ahmad, 21, said she now avoids the bus in Montreal because she is afraid she will be asked to remove her niqab, compromising her religious beliefs. At the news conference, Marie-Michelle Lacoste, who uses the name Warda Naili since she converted to Islam and adopted the niqab, said she has been “living in fear” the new law would stoke anti-Muslim feelings. Quebec Minister of Justice Stephanie Vallee told reporters she believes the law will stand up to the legal challenge.